Made of high quality aluminium alloy, very durable. Adopt the hollow design, making it lightweight, with good heat dissipation, preventing camera from overheating. CNC metal injection molded, stable deformation, for aerial photography, away from the impact of the wind. A fixed seat, easy to install. 1/4 inch screw hole, compatible with most tripods. 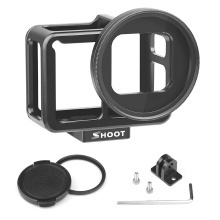 Can be mounted with the included 52mm UV lens or filter lens, polarizing lens of diameter 52mm. With a backdoor to protect your action camera well. An integrated cold shoe on the top allows to mount LED video light, microphone, etc. Special design does not interfere with GPS signals. Good use for vlog, video blog, video log with microphone.